Lockerbie is derived from Old Norse, with the ending meaning "settlement" or "dwelling" but there seems to be some doubt about who's settlement it was - Loker and Lockard have been put forward though no-one seems to know who they might be. At least the suggestion of Loki, the Norse god of fire and mischief is more specific. 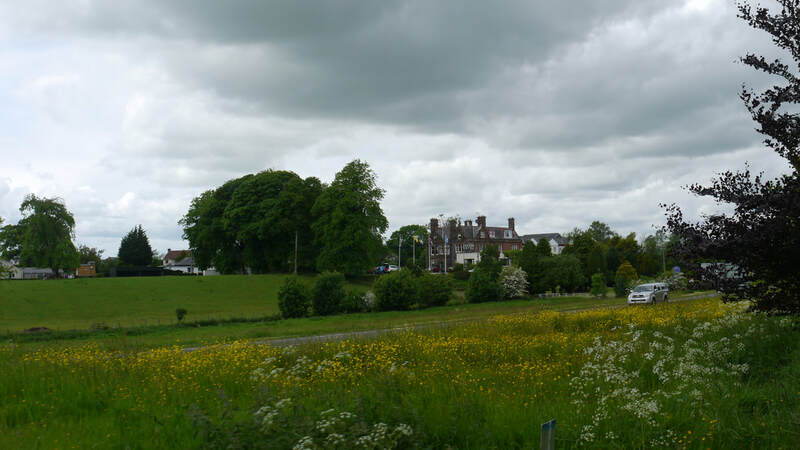 Lockerbie and Lochmaben are built on hills overlooking the Annan, as it would appear that the ground around the river was too boggy for the establishment of substantial settlements. 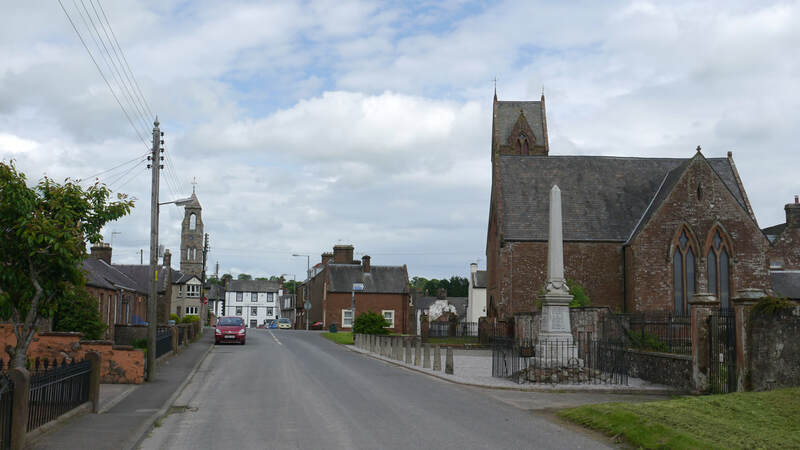 The parish name of Dryfesdale was taken from a church outside the town of Lockerbie established in 1116 at Sandbed, this was moved to Kiirkhill when it was washed away in 1617, which in turn was washed away in 1757, and the present site was gifted by the Laird. Sandbed is shown on modern maps just north of the rail crossing of the Dryfe. Kirkhill and the site of the old Church and Graveyard is shown on the 1st Ordnance Survey map, close to Dryfe Bridge. 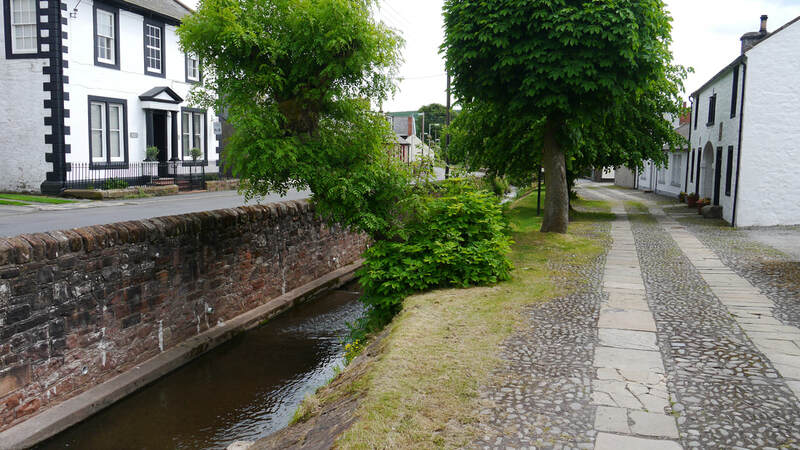 ​Beattock and Moffat are close to Threewaterfoot, where Evan Water and Moffat Water join the River Annan almost opposite each other. The Annan rises high up on Annanhead Hill at Devil's Beef Tub about 8 miles North - there is a pass through the Moffat Hills at 412 metres; and on the other side of the hill is Tweed's Well, the source of the River Tweed. The A701 follows this pass and the direct hilly route to Edinburgh. The watershed to the east forms the boundary between Dumfries and Galloway and the Scottish Borders; to the north the boundary between the Scottish Borders and South Lanarkshire follows the watershed between the Tweed and the Clyde; south is the preserve of the Annan then further west the Nith - the boundary between D&G and South Lanarkshire following the watershed between the latter two rivers and the Clyde. Moffat Water has come to Threewaterfoot from the NE, and the A708 heads up Moffat Dale to another pass at Horseman Rig at 331 metres on its way to meet up with the A7 and the Tweed near Selkirk. Evan Water comes from the NW as do the A74(M), the old road, Cycle Route 74 and the railway from Glasgow taking advantage of the lower pass at Beattock Summit, 10 miles north of Beattock, at around 315 metres the easiest option for . Even after the building of Telford's Road in 1816 Beattock's steep north slope was difficult for the stage coaches of the day - and for steam locomotives when the railway was built 30 years later - until they were replaced by diesels over 100 years afterwards, banking engines were always on hand to help. The road route to Edinburgh splits off a few miles north near Abington, the railway further north still at Carstairs. Nothing in Lockerbie. Whisky Shop in Dumfries - TB Watson (aka Drambusters) (13 miles). Nearest distillery - Annandale (11 miles). Ecclefechan did have a Distillery from 1825 possibly until as long as 1850, not shown on the first OS map, and little else to be found about it, but appears to have been at or close to Nether Collinhirst, not far from the former railway station. Ecclefechan (Latin "Ecclesia Fechani" or Gaelic "Eaglais Fheichein" - "Church of St Fechan" - possibly Féchín of Fore; alternatively Brythonic "eglwys fechan" - small church") is a small village on the old Carlisle to Glasgow route 6 miles south of Lockerbie, best known as the birthplace of Thomas Carlyle (an essayist and respected historian for some of his early work, but whose later works included a ﻿﻿defence of slavery﻿﻿, and have been regarded as helping to underpin fascism), and for Ecclefechan Tarts. It also has a whisky named after it, which was news to me until I saw the Wikipedia entry. Turns out that there is an Ecclefechan Whisky Company, but they don't seem to have a website, they did produce a Blended Scotch - subtly named 'The Fechan Whisky'. A more detailed description of Ecclefechan is in these notes to a photo on flickr. ​Robert Burns wrote a song The Lass O' Ecclefechan. Ecclefechan is also on the West Coast Mainline Railway, but its station was closed in 1960 - little remains. ​Beattock (Gaelic - "beath-achadh" - "birchfield") seems to exist mainly as a stopping point on various roads and railways of the past. ​It is the site for the Kirkpatrick Juxta Parish Church - "named in the 15th century Kirkpatrick-Juxta to distinguish it from four other churches of St Patrick in the See of Glasgow, namely Kirkpatrick-Irongray, Kirkpatrick-Durham, Kirkpatrick-Fleming and Kirkpatrick in Nithsdale. This Kirkpatrick was styled Juxta as being the nearest of the five to Glasgow, the seat of the Bishop"
Today, Beattock is the meeting point of a number of long distance paths - Romans and Reivers Route; Annandale Way; and the Southern Upland Way. Lochwood Tower, stronghold of the locally powerful Clan Johnstone, is some 3 miles south of Beattock off the B7020, it is now a fenced off ruin. Lochhouse Tower another, later Johnstone stronghold, built in 1536 is just north of Beattock off the A701, It has been completely restored, and is now let out on a self-catering basis. Moffat (Gaelic - "Magh fada" - "long plain"), although not on the direct route from Carlisle, was close enough to be a staging post - it was established well before Locherbie. A sulphurous well was found in 1633 and Moffat began to gain a reputation as a spa town, further enhanced by the discovery of a second well in 1748. 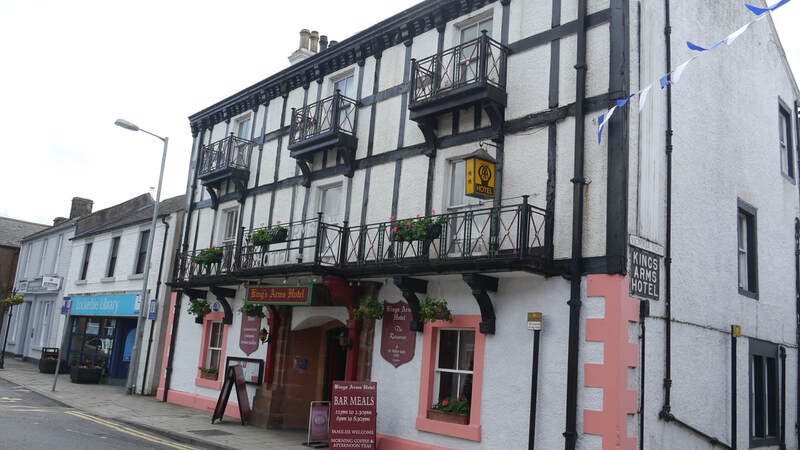 The Black Bull dates from 1683; the Annandale Arms and Buccleuch Arms from 1760. The 400 bedroom Moffat Hydropathic Hotel was built in 1878 which helpedthe argument for the town to be connected to the railway - the Moffat Railway a branch just under 2 miles long from the main line at neary Beattock was completed in 1883, but... The Hydropathic Hotel burnt down in 1921, and the railway closed to passengers in 1954. In keeping with its late 19th century reputation, the town had a new parish church built in 1887, the impressive St Andrew's built in local red sandstone. Johnstonebridge is halfway between Lockerbie and Beattock. The original bridge was built in 1818 as part of the Telford programme of road and bridge building. There were roads on both sides of the Annan before this, but no bridge in this vicinity. The Johnstones, Earls of Annandale and Hartfell, were the family controlling land around here, Raehills, 2½ miles away on the Kinnel Water, being the family seat. Johnstone Kirk and its Manse are marked on the 1750 Roy Lowlands map, and there's a ford near the church on the first OS map. The Government wanted to improve the roads and bridges and was prepared to pay 50% of the cost for approved schemes put forward by landowners. The 1818 bridge was replaced in 1939 on what was the A74 but having now been supplanted by the A74(M) has been reduced to B7076 - they are two separate bridges, despite the representation on the current OS Landranger map. Dinwoodie Station on the West Coast Main Line served the area from 1847 to 1960. Johnstonebridge Community Trust has a website. Annandale Water is an artificial lochan alongside which a service area for the old A74 was built, now upgraded for the A74(M) and providing a chance to interchange with the old road. Newton Wamphray (Possibly Gaelic "uamh-a-phraimh" - "cave of slumber" or "sorrow") is a village close to Johnstonebridge in the parish of Wamphray - the original village of Wamphraygate is a mile or so along the Wamphray Water, while Newton is an elongated village spread along the old Roman Road parallel to the Annan, which is crossed by Jocksthorn Bridge. The interestingly named Murder Loch was the site of a Roman Fortlet. The Station on the West Coast Main Line that served the area from 1847 to 1960, was originally Wamphraygate, but the name was changed to Wamphray. Lockerbie is unfortunately best known for the crash of Pan Am Flight 103, which was destroyed by a bomb over the town on 21 December 1988, killing all 259 on board and 11 in Sherwood Crescent, Lockerbie. A Garden of Remembrance has been established in Dryfesdale Cemetery on the Lochmaben Road. Long before that, the Romans had a camp in the vicinity, and the Norse derivation of the name points to ancient settlements in the area. The remains of an Iron Age fort can be found at Dryfesdalegate near the confluence of the Dryfe Water with the River Annan. Lockerbie seems to date back to at least 1194, though it was little more than a tower house and a few cottages flanked by a couple of Lochs (Quaas and Flosh, that were later drained). The first written record is of Lockardebi in 1306. The Battle of Dryfe Sands between the Maxwells and the Johnstones which took place in 1593 resulted in a massacre of the Maxwells. By the time of the Roy Lowlands map of 1750 "Lockerby" is clearly the largest settlement on the East side of the Annan in the area, though still smaller than "Loch-Maben" to the West. 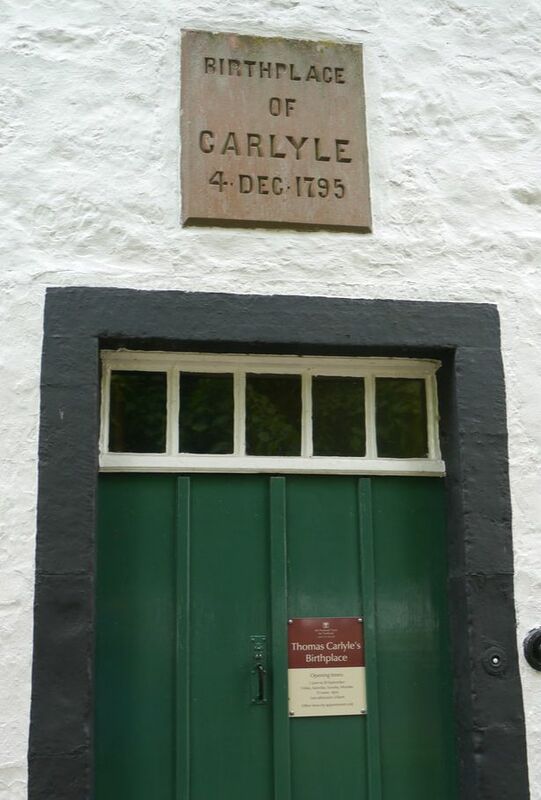 Lockerbie was (and is) on the main route from Carlisle north to Glasgow; through Annandale, the Beattock Summit and into Clydesdale - though Beattock is a higher pass than routes via Nithsdale, it is more direct. The road was a dangerous place even after the Union of England and Scotland in 1603, and by 1684, Lockerbie was still no more than a small village, though beginning to develop as a major lamb market. 100 years later the market had developed considerably as had the town, with parcels of land being offered by the Johnstones along the High Street. 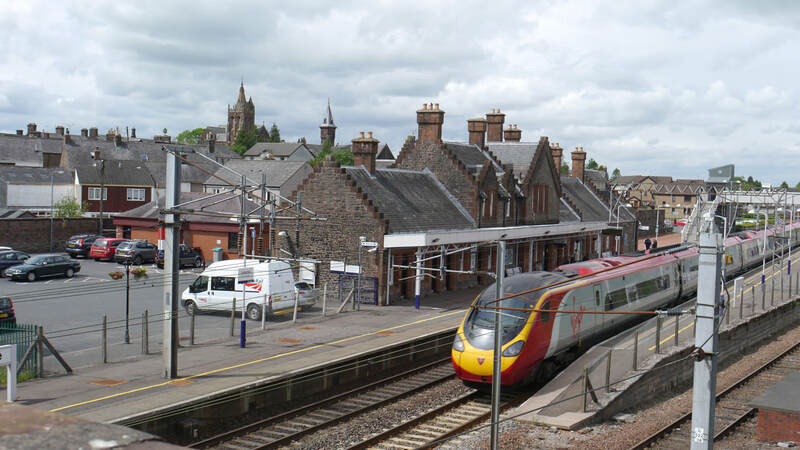 Lockerbie became an important staging post on the Glasgow to London route - enhanced with the construction of a better road by Thomas Telford through the town in 1816. Thirty years later this was joined by the railway - further enhancing the town as a market. Now of course, the town has been by-passed by the A74(M), and most trains speed through Lockerbie station without stopping. The Hallmuir Prisoner of War Camp was built in 1942, on the Dalton Road south of Lockerbie, but was empty after the end of WWII until it became home for 400 Ukranians who had been forced to fight for the Germans during the war and who were unable to go home for fear of reprisals. One of the huts was transformed into a colourful chapel in similar vein to the more famous Italian Chapel on Orkney. Lockerbie is on National Cycle Route 74. Lockerbie (LOC) rail station has level access to Platform 1 from Station Road, stepped bridge with lifts gives access to Platform 2 with regular trains to Carlisle and less regular trains to Edinburgh and Glasgow. Live train times.